It's only taken me almost an entire month to get to this post, but alas we are here and I'm ready to share how I got on with my goals for 2016. If you saw my 2016 highlights you'll see that I had a great year and my goals were well intertwined in making that year great. I can tell you now that I have succeeded in some, but in others not so much. Last year I did an update on my goals twice during the year. Both time it was to share a success and also because it was a great way of keeping track of those I'd reached and reminding myself about those I hadn't just yet. It's the first time I've ever kept track of my new year resolutions and kept aiming for them. I'm hoping to do the same this year too. UNIVERSITY - A goal I achieved and my biggest goal of 2016. I wished that in 2016, I would find myself starting university training to be a teacher and 3 months in, I'd been accepted to attend and train! It was the best day of the year without a doubt and if I went on any more about it you'd probably stop reading by now! I'm still so happy and excited by it and even more so today since I'd just received my results back for my last assignments. I'm feeling quite proud of myself right now. A HAPPY BODY - this goal has come back around again this year and even more so because I didn't reach it last year at all. I find the idea of exercising really stressful and it makes me feel super anxious. But alas, it is a goal I intend to reach even more so this year. I've started working out and have been on it for the last two weeks... I'm hoping that in a couple of months I can write my first post sharing before and after pictures... We will see. GROW MY HAIR AND NAILS - This is one of those weird ones where you can't quite decide if you managed it or not. I think I managed the growing my hair quite easily but my nails were a difficult one. At some points in he year they began being quite long for me, but it's been difficult to manage this one. I have brittle nails as they are and it's hard to get them to grow anyway so I gave up on this one pretty quickly. Maybe once I have some other things down I can think about getting my nails to a decent natural length soon. READ MY UNREAD BOOKS - Well I can tell you straight away that this one just didn't happen. I admit I had a ton of time over the summer holidays to do this but I just didn't. I think I finished one book last year and I should have read so many more. I didn't get anywhere close to finishing all my books but with so much going on last year, I'm not upset I didn't reach this goal. PHOTOGRAPHY - This goal was particularly to start photographing for my own happiness and not just for blogging. I remember thinking about this clearly and I did actually photograph more for myself this year but not as much as I wanted. I wish I could carry my camera everywhere with me because sometimes I see a really good shot that I want. I plan on taking my camera out a little more on the dog walks when it warms up, hopefully I can get some lovely shots of the countryside. 1k ON BLOGLOVIN' - In August I reached 1k on BlogLovin and that was a brilliant day. I've always worked so hard on my blog and having all that time I spent a lot of it promoting my blog and doing all the right things to reach a wider audience. Stats aren't everything but it was a goal I wanted to reach and really loved hitting that goal. I hope to hit 1.5k this year but with all the work I have I'm not sure how I'm going to do it if I'm being totally honest! I'll try though! WHAT CAT WORE - I hate saying this but I have been blogging less and less recently and with my confidence and weight issues, I have posted far less outfit posts than ever before. I really don't like that that was the case but I really couldn't post if I wasn't feeling confident. This goal sits hand in hand with the happy body goal, and I'm hoping this year with my workouts and my new fitness regime that I can finally post more outfits and share style much happier! BLOG PHOTOGRAPHY - I would like to say that my photography has improved but I think that is for you guys to decide really. I haven't had many opportunities to test out my photography skills over the last year but in my posts and with my DSLR I think I managed a pretty good job at improving my photography compared to my old standard of quality. I understand so much more about photography now anyway, so I think I can say I somewhat improved my photography. I don't know. You decide! So those were all my goals and though I didn't hit them all and in fact some of them were really unsuccessful it's sort of balanced in my mind. I reached my two highest goals and for that, I am happy. I liked last year, it was good to me but I'm hoping 2017 will be better! If you haven't seen, I posted my 2017 goals the other week. Check it out here. 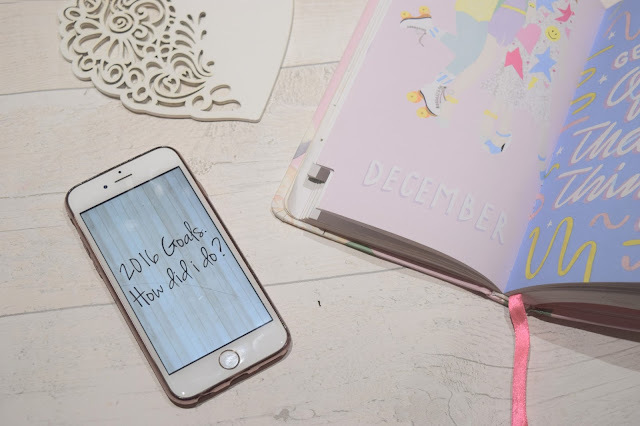 How did you do with your 2016 goals? I definitely think your blog photography has improved cat! You have to show me how to make those little photography studio areas you've made!